IN 1958 the Star insisted "serious steps" were being taken to deal with Lisburn's "rapidly-growing parking problem." There was a reported increase in police activity to curb osbtruction and the Urban Council's by-laws on parking were due to come into force. It was noted that there was a "great increase" in the number of heavy trucks passing through the town and there were more and more cases of obstruction. Police officers stationed in Lisburn carried out an investigation of the parking situation, particularly in Market Square, and issued warnings to drivers who had left their vehicles parked in unauthorised positions and so caused an obstruction. 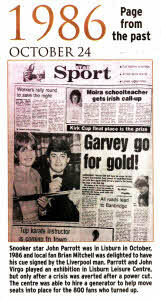 THERE was speculation in 1999 that Lisburn could become a mecca for ice skating enthusiasts after it was revealed at a meeting of Lisburn's Sports Advisory Council that a new ice rink could be built in the town. Proposals were made for a £100,000 ice rink at a new sports complex in Lisburn. A Dunmurry man, who was a member of the Ice Hockey Association's Committee, told the Council that Lisburn could not fail to make money and would draw large numbers of skaters from all over Northern Ireland and even further afield. However, it was thought the main obstacle to the construction of the ice rink would be the cost of the development, which was estimated to be in the region of £100,000. 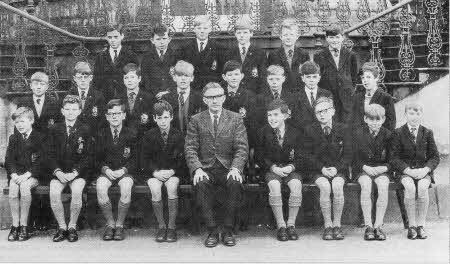 THE axe was poised over a rural primary school in 1985. Teachers, parents and pupils could not celebrate the ending of the school term with the usual holiday spirit as everyone was aware that the 129 year old school at Magherknock have been closing it's doors for the last time. school was threatened with closure due to the expiration of a six year lease. Difficulties arose over the renewal of the lease, the main problem being that the lease holders were not prepared to negotiate a new lease. The lease holders did say they would consider entering into negotiations about the sale of the property to the South Eastern Education and Library Board. However the Board said they were not in a position to purchase the property as the Department of Education would not grant approval. Negotiations for the renewal of the lease were underway and a campaign was launched in the hope of securing the future of the local primary school at Magheraknock, which was responsible for the education of around 50 children. IN July 1995 the Star reported that 'people power' had finally paid off after the Department of the Environment agreed to install a new pedestrian crossing on the Moira Road. The campaign was launched following two fatal accidents in the area in less than a year. A campaign was launched calling for the urgent installation of the crossing at Drumlough Gardens. However, the DoE decided the road did not warrant special consideration. The campaign was stepped up and was debated in the borough council chamber, as well as at Stormont, before the DoE eventually relented and agreed to install the crossing at the notorious accident blackspot. Councillor Seamus Close and Alderman Ivan Davis spearheaded the campaign and were delighted that the Department finally agreed to their crossing. Mr Close and Mr Davis had joined concerned residents in a kerbside protest after a fatality at the site of the crossing. At the time Mr Close said: "I am obviously delighted that the Department has recognised the need and justification for a pedestrian crossing- One must say, better late than never." 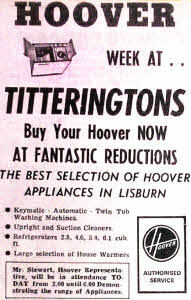 1986 local store Titteringtons had some fantastic offers on a new Hoover appliance. IN February 1999 developers revealed plans to develop a new shopping mall on the site of the former swimming pool in the centre of Lisburn. The developer, Cusp Ltd, announced work would begin on what would become Lisburn Square in August of that year. The development was to include retail stores, as well as residential, office and leisure facilities. It was expected the development would take 18 months to complete. IN 1969 a local councillor made a call for an anti litter campaign in Lisburn. He said people were bet coming completely "un-litter 1 conscious" and he thought consideration should be given to the promotion of a "Keep Lisburn Tidy" campaign. He suggested that local schools could be approached to take part and the campaign could last for a week.